I remember the first time I ever cried in my cubicle. I was 20 years old and had just spent a long day on the Hill following a girl, not much older than I was at the time, who was lobbying for cervical cancer awareness. She had joined a bunch of women to speak to Congressmen and politicians of the like. Her older sister had died not too long ago, rather quickly after being diagnosed with the disease. However, medical professionals encouraged her to postpone certain treatment in order to save her eggs so she could later have children once they removed her affected organs. Instead, it sped up the process. Instead, it killed her. And this now this girl in DC, who lost her sister, also lost her parents around the same time. She was alone and all she had left was this fight for something she believed in. That was the first day I realized I needed to write about health. The things I learned that day about cervical cancer terrified me, but it terrified me more that there were people out there who didn’t know these things. I was strong all day with that girl as she rattled off facts with a stoic face in between pained anecdotes of her personal story. It ripped my heart out. But I went throughout the day as super journalist, taking notes, asking questions, absorbing it all like a sponge. But at the end of the day, I don’t like to pretend none of that stuff affects me or doesn’t matter or is “just another story.” Instead, I came back to my cubicle, threw my equipment down, and cried. And you know what? I wrote one heck of a story. It ran on our DC-based newswire and was later picked up for a print edition in a Florida newspaper. I disagree. While there is merit and complete necessity in conducting yourself in a professional manner on the field and in distancing your emotions as you try to absorb the emotions of your subjects and stories– I think it’s the good journalists who FEEL EVERYTHING. Even Anderson Cooper threw down his camera to carry a bloodied child over a barricaded wall in Haiti. He couldn’t just stone-cold watch the story unfold. 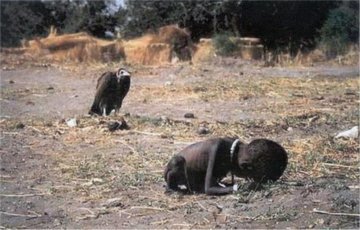 This photographer of this Pulitzer Prize photograph said he was haunted by the terrible things he’s seen. If my options are being haunted by terribleness or crying like a pansy in my cubicle– I take crying. It’s the writer who sits down and opens the floodgates of all those emotions they witnessed while out on the field who can powerfully convey those same emotions in their story. But you have to process those emotions in some way so you don’t go crazy or become detached from the world. And I’m sorry, but my reaction to the terrible things I’ve had to write about is not reaching for the bottle like my professors and even newspaper mates used to joke about. I’d rather be a wimp and cry it out in my cubicle, without abandon, so I can honestly represent the stories of the people I speak to in the way they deserve. I was reminded of this earlier in the week when I was working on a blog post for Samaritan’s Purse. I wasn’t writing the post, but rather found it on the personal blog of the wife of one of our doctors. Recently, one of our doctor families lost their daughter to brain cancer suddenly while serving in Kenya. Their daughter was under two years old. So, I found the blog, read it, talked to my boss about it, contacted the people for permission, edited the blog, and then posted the pictures and text on our organization’s blog to have it set to run today. It wasn’t until I was posting the pictures that I lost it. The pictures they had given me were beautiful– their daughter’s two, huge eyes staring straight into the camera, a picture of the mother holding her daughter, and one of the baby driving a toy car while her brother stood behind her. She’s gone. (I encourage all of you to read the moving piece written by the mother/wife here). But I’m not ashamed that their story made me cry. While inconvenient, maybe occasionally embarrassing, and not something people tend to broadcast– I hope I don’t lose that. I hope I can still connect with the world around me in a way that not only moves me, but moves my readers too. And more than anything, I am grateful for that first real cry I had writing a story about the girl lobbying for cervical cancer awareness. It was that moment I realized I wanted to not only write about health, but help other people become well informed so they can live happier, healthier lives too.